The Dark Ranger: (D)aaaawes Yeah! Tom Renney made the wrong decision at the beginning of this season. He sent our redemption back to the minors. 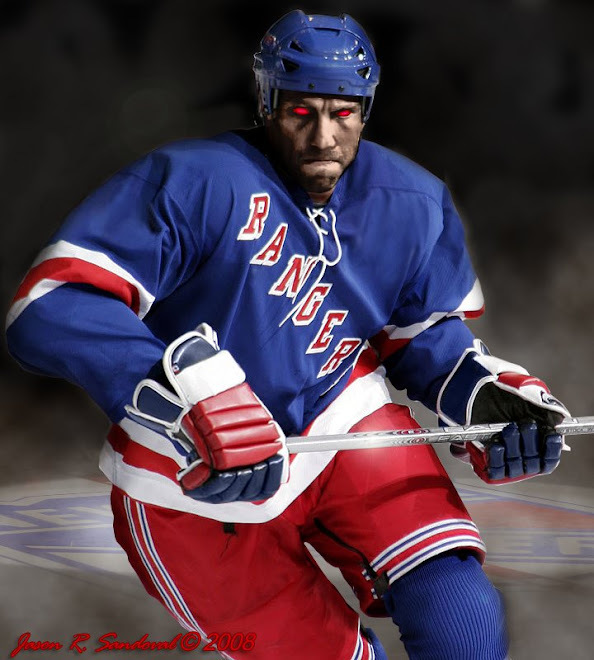 Due to multiple injuries on the NY Rangers bench, Nigel Dawes was sent down from the Hartford Wolfpack for last night"s victory against the New Jersey Devils. 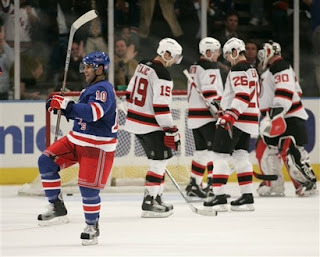 The Rangers beat the Devils 2-0. Dawes scored both goals and is sure to become a permanent fixture on the NYR roster. After a stellar training camp performance this summer and his surprising triumph last night, Coach Renney is sure to keep him around. The Rangers are now 3-5-1. The second star goes to King Goalkeeper Henrik Lundqvist, who again reminded us how flawless he can be. Henrik is the greatest asset to the Rangers, simply, a great goalie. Shutting out the rival Devils is what the doctor ordered and keeps the medicine man away, or rather, the Blueshirt management from altering the team. "Wins" means everyone stays, so the hot seat may gradually cool down if we see a solid Blueshirt performance against Toronto on Saturday followed by our arch-nemesis rival NY islanders Monday evening. Maybe reflecting on the last half of the 06-07 season, where we discovered the potential of such players as Ryan Callahan and Dan Girardi, and last night's performance of Nigel Dawes will remind Tom Renney, Glen Sather and the gang that the future of this great franchise relies on this upcoming youth movement. Before leaving for the Phoenix Coyotes, assistant Ranger coach Don Maloney set up the Blueshirts with a new prospect philosophy, creating the possibility of a young team and focusing on building prospects every season. This is our future in Rangerland, folks. Last night, Nigel Dawes was our redemption, one of many players to come.